How to use Rotary Tables to increase productivity with the most cost effective way of discharging and loading products for your picking and packing production line conveyors. Our tables are one of the safest on the market as all boxed in and ce marked. Our Rotary Turntables are fabricated in s/s making it suitable for the food, beverage, chemical clean rooms and pharmaceutical industry. Other size can be offered at additional cost. Stop Start Buttons are supplied as standard on all our rotary packing tables. All Rotary Tables are fitted with a fixed speed 4.7 rpm gearbox as standard. Special speeds can be offered at no extra cost. Our table tops run true to 1.5mm in deflection. This therefore ensures a very close transfer from or to the feeding conveyor. All Stainless Construction bespoke Packing Tables and Packing Stations to suite customers specification. Allowing multi product packing at the same time thus enabling a number of tasks to be done in a small area. Contact C Trak for a quotation for your specific need. 1. What speed can I run my table at? This will depend on the product you have but usual speeds are 4.7 revs per min to 15 revs per min. 2. Can I use your rotary turntable with food products? 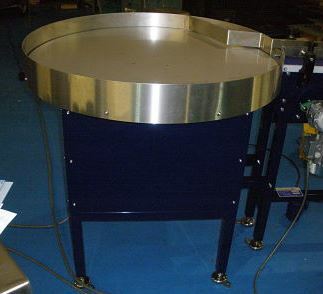 Yes our rotary tables are made of stainless or plastic and can be used in the food industry. 3. What sizes are C Trak's tables? 1m, 1.2m, 1.5m are our standards but you can have it made to any size on request. 4. Can I move my product from one rotary table to another? Yes close transfer can be achieved at approximate 2-3mm. It is achievable on a turn table. 6. How thick is the table top? 7. Does the table top run true? 8. If my table top become worn or damaged can I replace it? A new table top can be fitted with ease. 9. Is the speed variable on your rotary tables? Yes this is achieved by adding an invertor or mechanical variator.